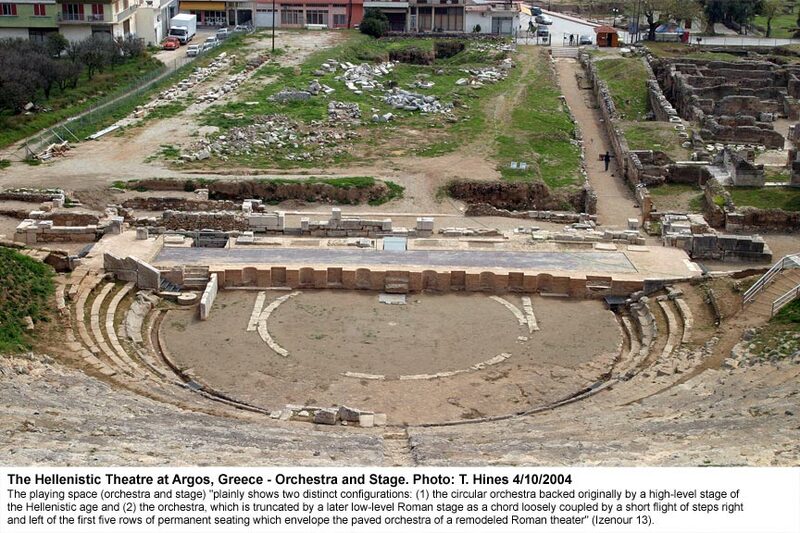 The ruins of two distinct theater sites, situated just 100 meters from each other, have been excavated in Argos. The first recorded date for excavation of a theater here was 1892, when I. Kophiniotis partially unearthed the larger, Hellenistic theater. Although it is unclear when, exactly, the theaters fell into disuse, changes made to the theater, the odeum, and other Argive sites point to sustained activity as late as the fourth and fifth centuries A.D. 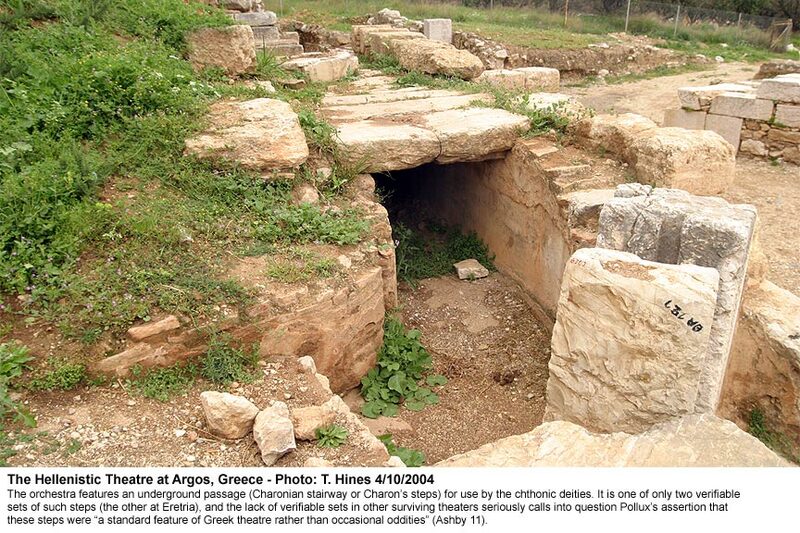 These theaters could have been buried for as many as 1,400 years (Princeton Encyclopedia of Classical Sites). After the initial work by Kophiniotis, seven excavations were undertaken at Argos under the aegis of the French School of Archaeology (Ecole Francaise d'Athenes) by C. Wilhelm Vollgraff: five between 1902 and 1912, and two more in 1928 and 1932. In 1952, French School excavations were taken over by G. Daux and P. Courbin and from 1954 to 1956 by J. Bingen and G. Roux. New excavations were undertaken in 1981 and 1982 by C. Abadie and J. Des Courtils and finally for four consecutive years, between 1986 to 1989, investigations (including tests and cleaning which revealed the proskenion foundations to be homogenous) were being conducted by A. Pariente and J.-Ch. Moretti (Catling 18). In 1993, the European Union Commission included the Argos theater site in its allocation of the Delors II budgetary package for Greece for the period 1993-1999. 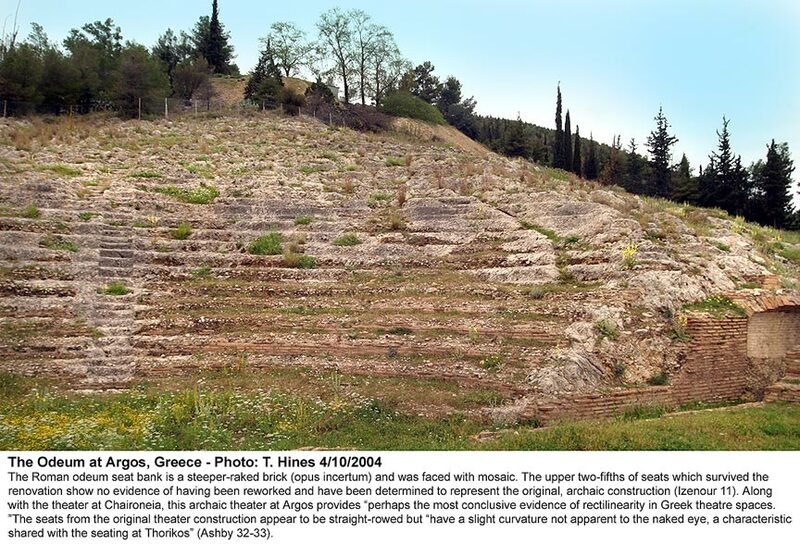 According to the Hellenic Ministry of Culture, this money was earmarked for "consolidation and restoration of the Theatre"; however, it is unclear whether new information can be added to the history of this site based upon work accomplished via the Delors II funding. 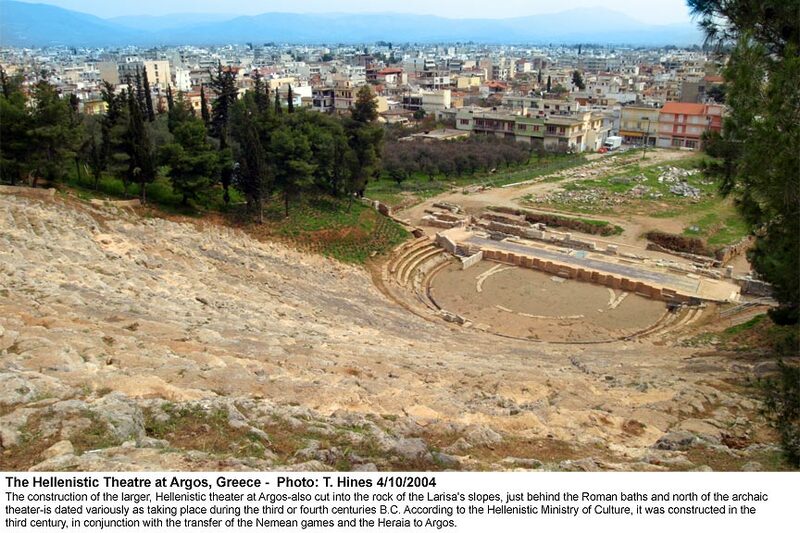 The oldest of the two theatres was carved into the lower rocky slopes of the Larisa in the fifth century B.C. 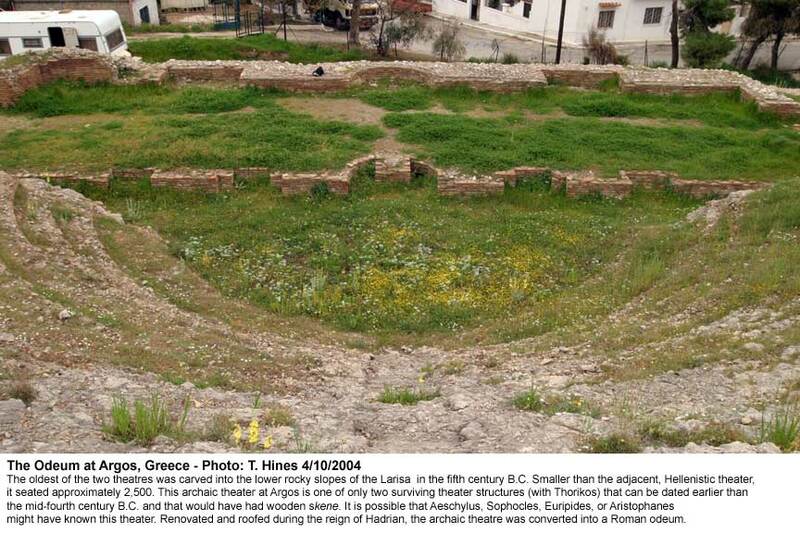 Smaller than the adjacent, Hellenistic theater, it seated approximately 2,500. This archaic theater at Argos is one of only two surviving theater structures (with Thorikos) that can be dated earlier than the mid-fourth century B.C. and that would have had wooden skene. The wooden skene, "known mainly through vase paintings[,] have left no physical traces beyond some stone sockets into which wooden posts or beams were inserted" (Ashby 17). It is possible that Aeschylus, Sophocles, Euripides, or Aristophanes might have known this theater. During the reign of Hadrian, the archaic theater was renovated and roofed by the Romans to form an odeum. It is now often conventionally referred to as "odeum" instead of as "theater". The site is "unusual because approximately three-fifths of the seats nearest the stage were lost (reworked) when this portion of the auditorium and stage" were renovated. The Roman odeum seat bank is a steeper-raked brick (opus incertum) and was faced with mosaic. The upper two-fifths of seats which survived the renovation show no evidence of having been reworked and have been determined to represent the original, archaic construction (Izenour 11). 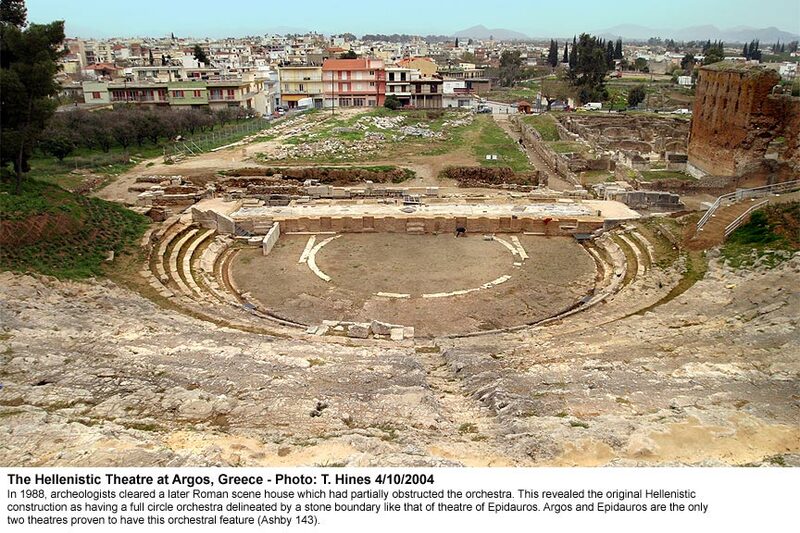 Along with the theater at Chaironeia, this archaic theater at Argos provides "perhaps the most conclusive evidence of rectilinearity in Greek theatre spaces." 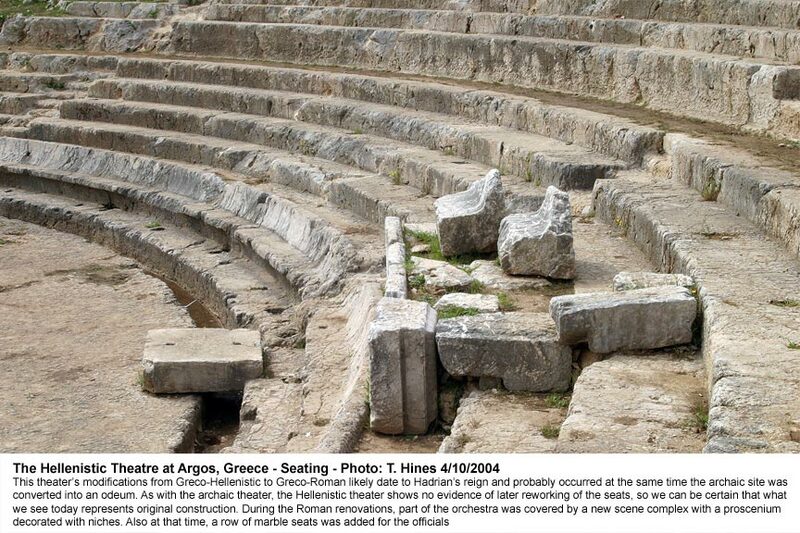 The seats from the original theater construction appear to be straight-rowed but "have a slight curvature not apparent to the naked eye, a characteristic shared with the seating at Thorikos" (Ashby 32-33). Although the real function of the archaic theater has not been determined, Tomlinson speculates that its small size suggests it as a "meeting place of a restricted gathering. This could be an indication of political, or perhaps religious, exclusiveness" (19). It could also have functioned as a music hall. Pausanias makes no mention of this structure in his descriptions of Argos. The second or Hellenistic theater at Argos (320 B.C.) in plan, except for the end portions of the first five rows added in dry lad-up stone masonry adjacent to the circular orchestra, is essentially a rectangle of about 80 curvilinear seating rows, each ending somewhat randomly at the sides as the stone face of the hillside plays out. Access to this seating is, in the main, from the orchestra and three access terraces to the left, at the first crossover, and above leading into five aisles, each having twice as many step risers as seating risers (same as for the archaic theater). The center aisle is equal in length to the auditorium; the two equidistant radial flanking pairs of aisles are of shorter indeterminate length (Izenour 13). At one time, a high wall situated at the top of the auditorium prevented unauthorized entry and likely improved acoustic quality. However, reports indicate that the acoustic quality at the site remains excellent today even without the resonance provided by this wall. 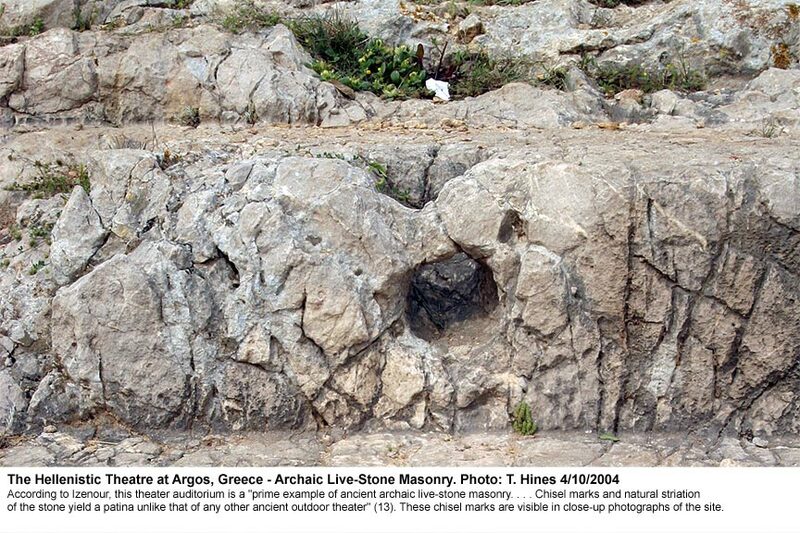 The orchestra features an underground passage (Charonian stairway or Charon's steps) for use by the chthonic deities. It is one of only two verifiable sets of such steps (the other at Eretria), and the lack of verifiable sets in other surviving theaters seriously calls into question Pollux's assertion that these steps were "a standard feature of Greek theatre rather than occasional oddities" (Ashby 11). In 1988, archeologists cleared a later Roman scene house which had partially obstructed the orchestra. This revealed the original Hellenistic construction as having a full circle orchestra delineated by a stone boundary like that of theatre of Epidauros. Argos and Epidauros are the only two theatres proven to have this orchestral feature (Ashby 143). This theater's modifications from Greco-Hellenistic to Greco-Roman likely date to Hadrian's reign and probably occurred at the same time the archaic site was converted into an odeum. As with the archaic theater, the Hellenistic theater shows no evidence of later reworking of the seats, so we can be certain that what we see today represents original construction. During the Roman renovations, part of the orchestra was covered by a new scene complex with a proscenium decorated with niches. 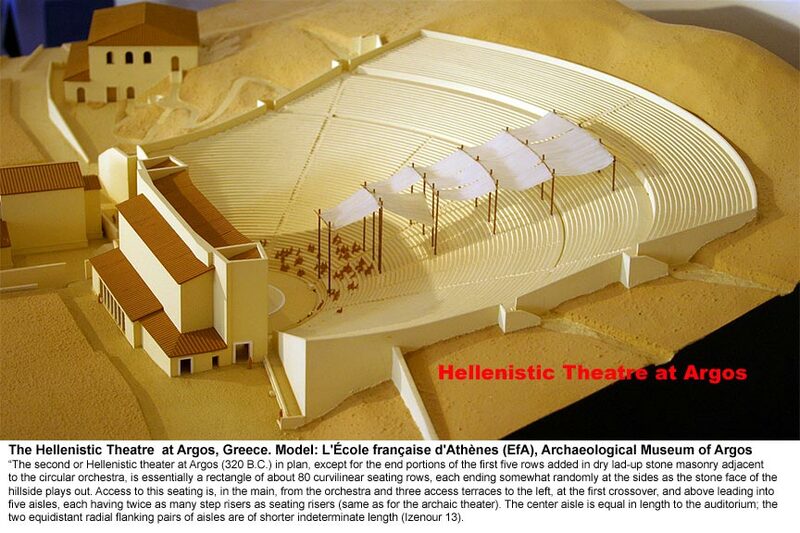 Also at that time, a row of marble seats was added for the officials as well as a cloth canopy (velum) for the audience's sun protection (Hellenistic Ministry of Culture). Evidence for the canopy structure has been described by Architect Leo Masuda, who notes the presence of a post-hole on every thirteenth step in this theater, which would have held the pillars to support the canopy. The Romans altered the shape of the orchestra and of the scenic complex many times. Of the latter, which had a proscenium and a Doric colonnade in its inner side, only the foundations and Charon's steps from the scenic complex to the orchestra have survived (Hellenistic Ministry of Culture). The playing space (orchestra and stage) "plainly shows two distinct configurations: (1) the circular orchestra backed originally by a high-level stage of the Hellenistic age and (2) the orchestra, which is truncated by a later low-level Roman stage as a chord loosely coupled by a short flight of steps right and left of the first five rows of permanent seating which envelope the paved orchestra of a remodeled Roman theater" (Izenour 13). According to Izenour, this theater auditorium is a "prime example of ancient archaic live-stone masonry. . . . Chisel marks and natural striation of the stone yield a patina unlike that of any other ancient outdoor theater" (13). These chisel marks are visible in close-up photographs of the site. The Nemean games and Heraia were transferred to Argos during the third century B.C. (Hall), and the theatre likely served as a venue for the associated music and drama contests. It was also used for the Ecclesiai of the Demos. In Roman times, it was used for a variety of festivals and hosted mock hunts, and gladiatorial combat. In yet a later stage under Roman rule, a pool was built on the orchestra for stages naval battles and aquatic games (Hellenistic Ministry of Culture). The theater is still periodically used for cultural performances. During tourist season, visitors must pay an admission fee to view the site. There is some skeletal information known about the site before the theaters were constructed. Part of what archaeologists call a "C building" was identified in the latter part of the twentieth century and seems to have been razed for construction of the theatre (Catling 18). No additional information about the C building is known at present, and its investigation may bear fruit in regards to Tomlinson's suggestion that a simpler theater probably existed on the site before the surviving structure. 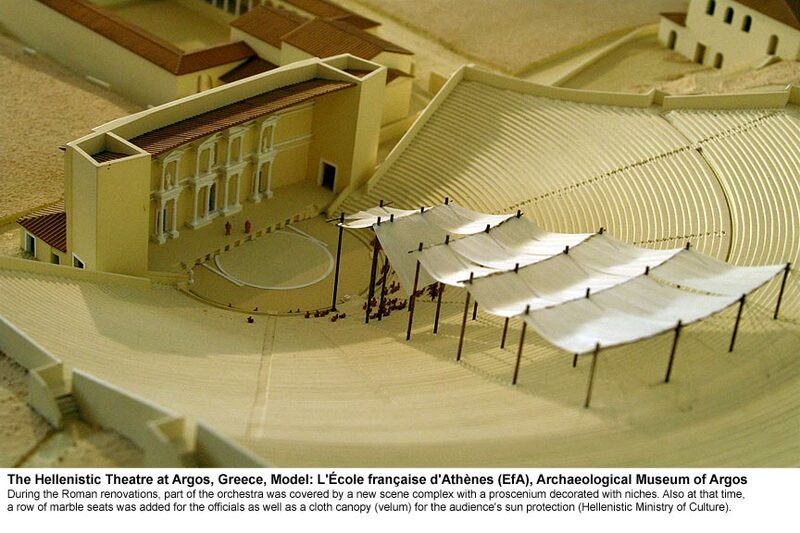 Also, before construction of the theater, the site had been dedicated to the cults of the Dioscuroi and Hercules. 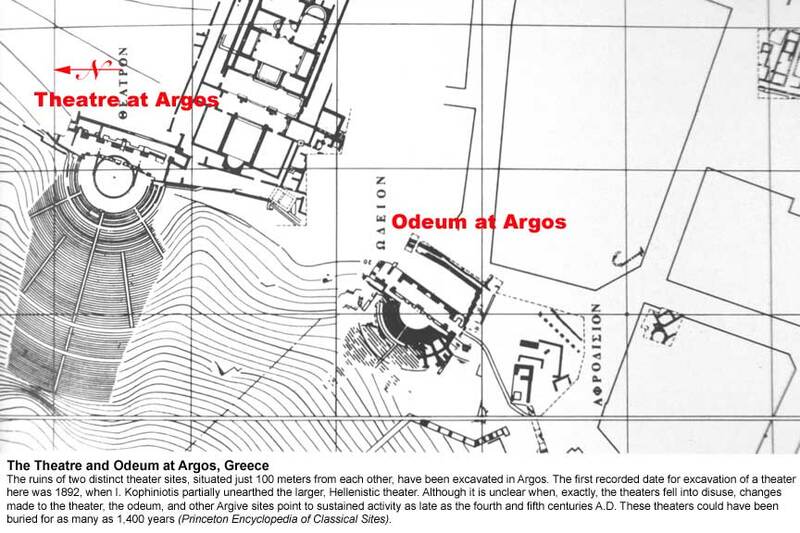 While the inclusion of legend in a historical investigation of this site may meet with objections, it is, perhaps, in line with the spirit of the subject to include such elements - which we could say comprise the diegetic space - of the theatrical sites at Argos. Pausanias tells us that the first inhabitant of the Argolis region was Phoroneus, whose father, Inachus, "was not a man but the river." The river Inachus and two other rivers, Cephisus and Asterion, once judged a dispute between Hera and Poseidon about the land's ownership, granting it to Hera. As punishment, Poseidon "made their waters disappear. For this reason neither Inachus nor either of the other rivers . 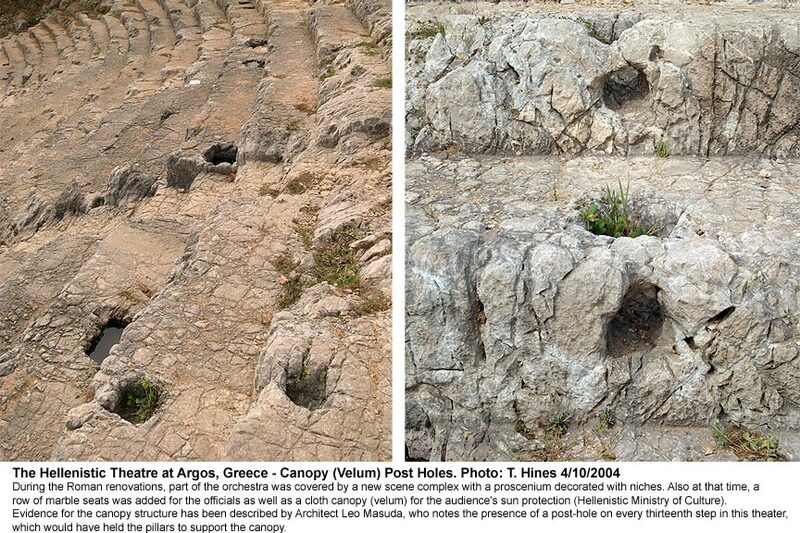 . . provides any water except after rain" (Pausanias 2.15.5). When he relayed that legend, Pausanias was describing the journey from Corinth, past the ruins of Mycenae, on the road to Argos. One gets a distinct sense that the landscape and the tradition were inseparable for him even though he knew the tradition was legend. Not far from the Place of Judgment is a theater. "Among other things worth seeing," writes Pausanias, "it contains the statue of one man killing another; the slayer is the Argive Perilaus, son of Alcenor; the slain man is the Spartan Othryadas. Perilaus had previously won a prize for wrestling at the Nemean games" (2.20.7). South of the two theaters is a sanctuary of Aphrodite who, for the Argives, was most closely associated with war and with Ares (Tomlinson). In Aphrodite's sanctuary, Pausanias describes "a slab with a representation wrought on it in relief of Telesilla, the lyric poetess. Her books lie scattered at her feet, and she herself holds in her hand an helmet, which she is looking at and is about to place on her head" (2.20.8). This image, which dates to approximately 510 B.C., depicts not only the Argive emphasis on those warrior traits to be found in its people (as also demonstrated by the statue Pausanias described at the theater), but also another moment of judgment in Argive history. In the case of both of these statues, as well as the surrounding grounds, themes of war and judgment are strong. Interestingly, both theaters also face the site of an ancient cemetery. These details may contribute to an interesting semiotic read of the site. Ashby, Clifford. Classical Greek Theatre: New Views of an Old Subject. Iowa City: U of Iowa P, 1999. Catling, H.W. "Archaeology in Greece, 1986-87." Archaeological Reports 33 (1986-87): 3-61. Gephard, Elizabeth. "The Form of the Orchestra in Early Greek Theater." Hesperia 43.4 (October-December 1974): 428-40. Hall, Jonathan M. "How Argive Was the 'Argive' Heraion? The Political and Cultic Geography of the Argive Plain, 900-400 B.C." American Journal of Archaeology 99.4 (Oct. 1995): 577-613. Izenour, George C. Theater Design. 2nd ed. New Haven: Yale UP, 1996. Moretti, J.-Ch. 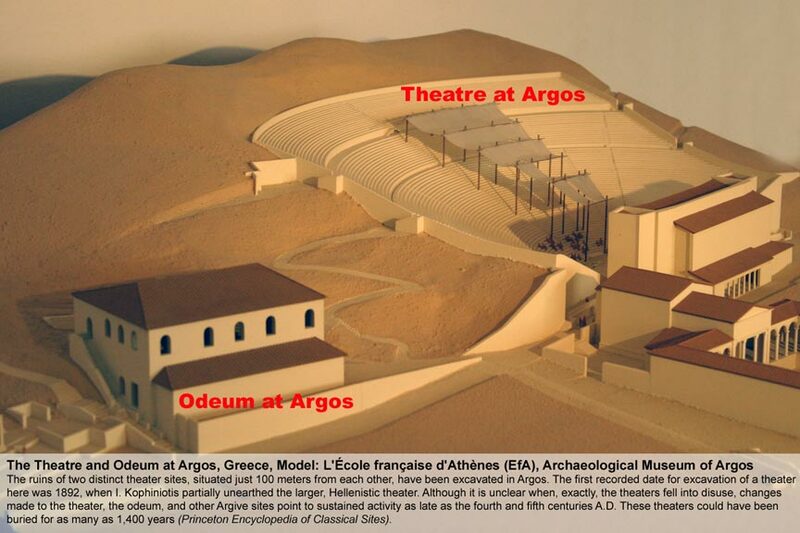 "Argos: Le theatre." Bulletin de Correspondance Hellenique 112 (1988): 716-17. Pausanias. The Description of Greece. Trans. J.G. Frazer. London: Faulder, 1898. Tomlinson, R.A. Argos and the Argolid: From the End of the Bronze Age to the Roman Occupation. Ithaca NY: Cornell UP, 1972. NOTE: According to Ashby, a book published in 1969, titled Nuove ricerche sui teatri greci arcaici, by Anti and Polacco "has some interesting, even startling observations on the theatres at . . . Argos, . . . but is virtually unknown today" (27). Metis site has 360-degree interactive images of the theater and surrounding areas. Greek Press Office BBS, Ottawa, release in English of the Athens News Agency Bulletin, dated October 22, 1993. Dateline: Brussels. Author: C. Verros.